Healthy gluten-free pumpkin coffee cake. Made with whole grain flours, this recipe is naturally gluten-free and uses 75% less oil than the traditional ones! Whenever you add pumpkin to a recipe it just seems to get better. Especially in my pumpkin spice obsessed world. Anytime I see something with pumpkin the in the title, you’ve got me hooked. I’m especially a fan of pumpkin breakfast recipes. I think it’s the perfect ingredient for the morning because it’s sweet, but also healthy. And the warm spices that go along with it are just so cozy and delicious! So today we’re taking a classic breakfast recipe – coffee cake – and making a fabulous pumpkin version that I know you’re just going to love. I almost always tell you that the recipes I create on this site are healthy. By know you know that’s my MO, but what does that actually mean? I figured it might be helpful for us to compare my gluten-free pumpkin coffee cake recipe to the classic recipe. 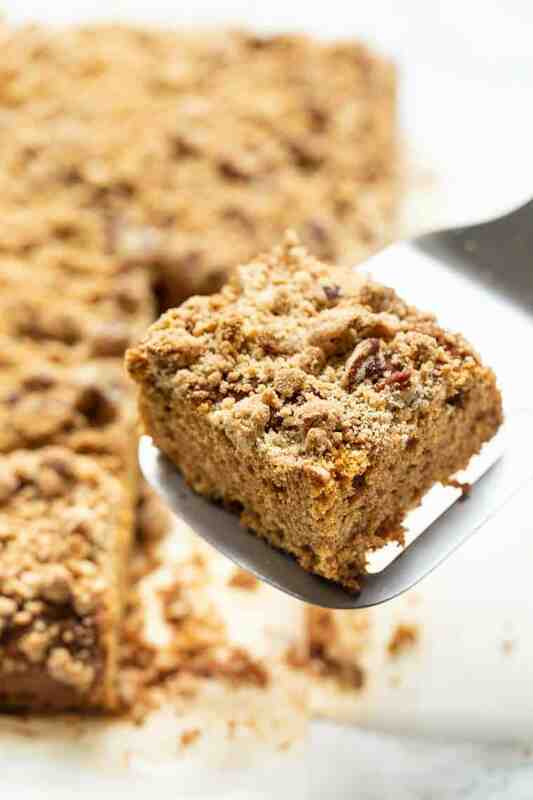 What’s actually in a traditional coffee cake? It’s definitely one of those options that I didn’t realize was unhealthy until I made my first batch. Not only does the classic version include loads of sugar, but also oil/butter. Especially if we’ve got a crumble topping – which we do here (woohoo!) – we’re adding even more of both of those. 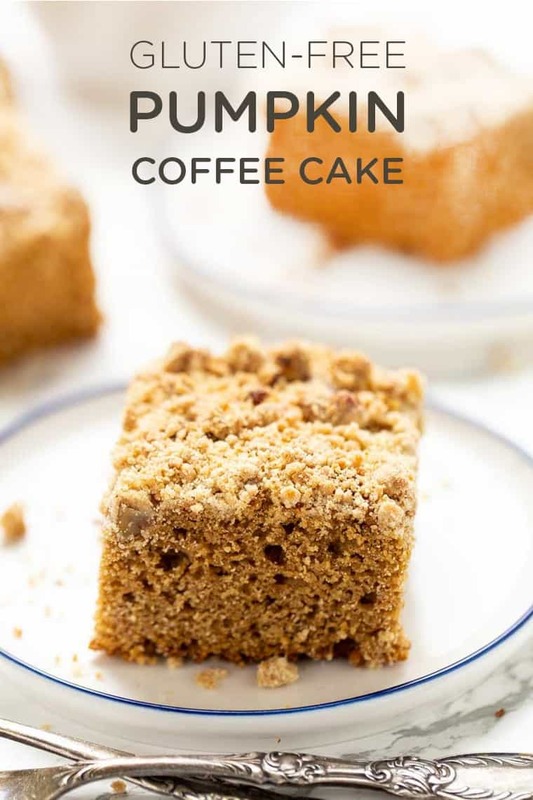 So I would say… a classic coffee cake is not healthy and isn’t something you should be choosing for your breakfast options. One of the things I strive for in my recipe creation is making sure that when I’m giving you a gluten-free baked good, it’s not just full of starches. 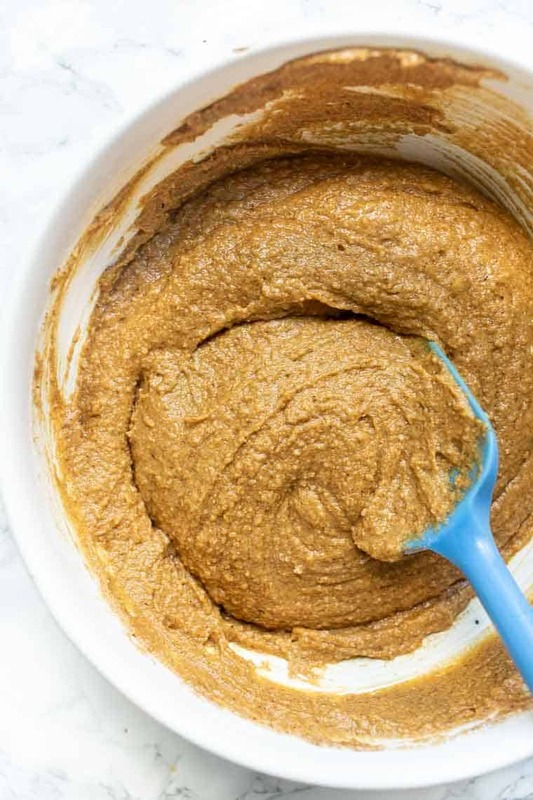 Many times gluten-free cakes and muffins are primarily starch, but in this recipe, we’re using whole grain, gluten-free flours to ensure it’s nutritious BUT also delicious! 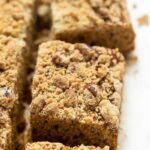 It’s got the perfect, classic coffee cake texture, is topped with a delicious pecan crumble topping, and makes the best (and healthiest) breakfast treat. 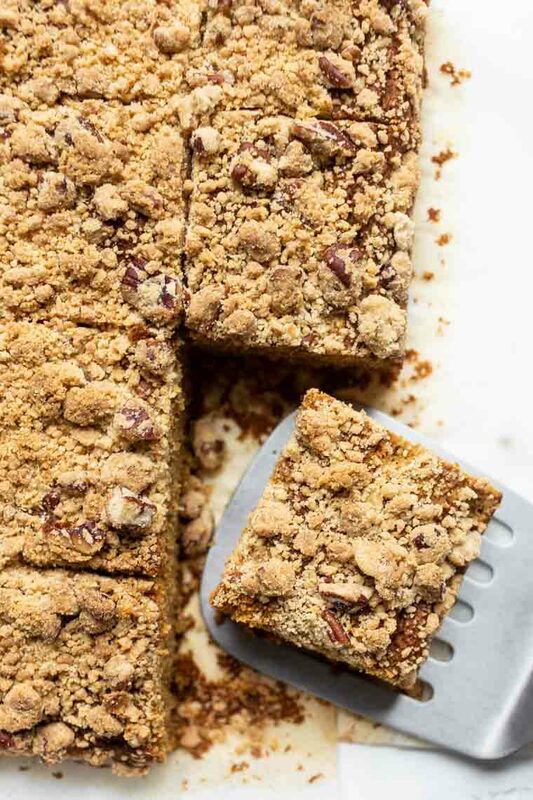 I would say we just all need pumpkin coffee cake all fall long! 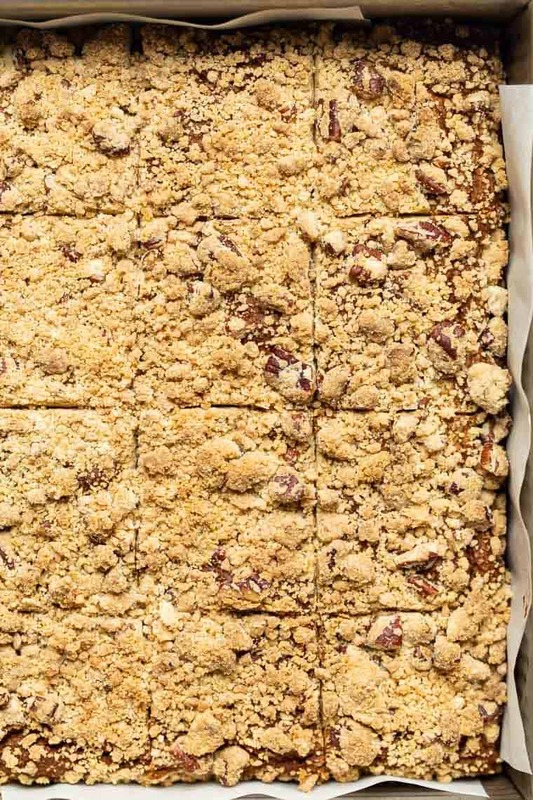 This healthy pumpkin coffee cake is the perfect fall breakfast. Made with whole grain flours, it's naturally gluten-free and uses 75% less sugar and oil than the traditional versions! Preheat the oven to 350 degrees F. Line a 9" square baking pan with parchment paper and set aside. In a separate bowl, combine your eggs, pumpkin, milk, oil and vanilla. Beat these into the dry ingredients until a very thick batter begins to form. You want the dough to be slightly thicker than a cake batter. Transfer the mixture into your baking pan and set aside. Combine all the ingredients into a small bowl and beat until you have a sandy texture. Sprinkle the mixture evenly over the top of the cake. Bake in the center of your warmed oven for 40 - 45 minutes. Test with a cake tester by placing it in the center of the cake. If there is nothing on the stick when you remove it, the cake is ready! Remove from oven and allow to cool for 10 - 15 minutes before transferring to a wire rack to cool completely, before slicing into squares. This is DELICIOUS. I’ll be honest, I only make most recipes once – so many recipes out there! But we have an exception policy, if it’s ermagerd GOOD it gets put into the permanent rotation. This took apx 2 bites to get declared a keeper. I made one change, I took out one Tbsp of almond flour, and added two Tbsp of flax meal. I just like how it keeps baked goods fresh tasting. I also hadn’t tried the toasted quinoa flour, wow is that a nice touch! That bitterish flavour/smell was my biggest dislike about that flour, toasting removes that entirely. Love your recipes and helpful tips! WOW this is an amazing review – THANK YOU! So glad you enjoyed it 🙂 And yay for toasted quinoa flour. Isn’t it amazing? It’s a game changer! I haven’t tested, but I think you could try flax eggs! Your last line says “Glaze when cool” – glaze with what?